AVON LAKE, Ohio - Jan. 27, 2017 - PRLog -- Heat control specialist, Design Engineering, joins a growing chorus of sponsors to support the Garage-Girls (http://garage-girls.com/) Ultimate Biker Makeover. 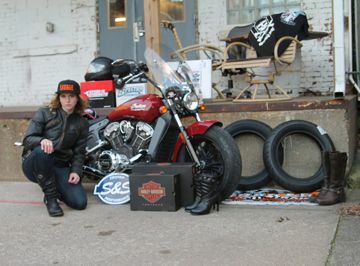 The Garage-Girls Ultimate Biker Makeover contest, now entering its ninth year, offers the opportunity for one well-deserving winner to get "Hooked-up" with products and services from major supporting sponsors. Contestants are encouraged to submit an essay of 600 words or less describing why they are most deserving in need of a biker makeover along with a photo of the entrant with their motorcycle. Four finalists are selected and one grand winner. "Bringing on DEI as a sponsor is a great fit for our program. They have some cool items that any biker makeover should not be without, says contest organizer, Sara Librte. "We all know of riders with worn tires, brakes, and busted parts and thought, this isn't safe. The purpose of the Garage-Girls Ultimate Biker Makeover is to hook-up one deserving rider with the gear they need for their body and their machine," she added. "We are excited to be partnering with Garage-Girls for the Ultimate Biker Makeover. The makeover contest is a fun way to connect to our female customers and learn about the specific heat challenges they experience," said DEI Powersports Manager Brian VanKoevering. To learn more about the Ultimate Biker Makeover, click here (http://garage-girls.com/ultimate-biker-makeover/). To learn more about DEI products click here (http://www.deipowersports.com/). Formed in 1995, Design Engineering, Inc.™ (DEI) is a major U.S. manufacturer and supplier of high performance automotive aftermarket products selling worldwide to a large number of commercial markets – automotive and racing, V-Twin, Sportbike/Metric, ATV/UTV/Off-road, 12 Volt/Car Audio, Industrial, Marine, and Aeronautical. DEI, located in Avon Lake, OH, specializes in the development of thermal and acoustic performance products as well as cryogenic intake systems and related accessories under the CryO2™ brand, acoustical insulation, sound deadening products under the popular Boom Mat™ brand, as well and a full line of performance coolant additives under the brand Radiator Relief™. Garage-Girls.com is the exciting established website developed to meet the growing needs of women who are seeking information about motorcycles/automotive and the culture. Our intent is to provide safe and accurate information. The focus of Garage Girls is to encourage women to maintain a balance between their love of motorcycles, cars, and anything in the garage with a healthy body and lifestyle.